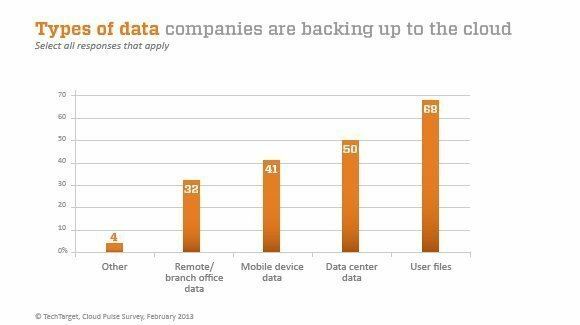 Backing up to the cloud is still the most widely used cloud storage service, and companies are increasingly turning to cloud backup services to help them cope with key data growth areas: user files and other non- or semi-structured data. Among our survey respondents, 68% extend their file storage data protection with a cloud data backup service. Other application data also finds its way from the data center to the cloud, with 50% of those surveyed saying they use cloud backup to copy data stored in primary data centers. Cloud backup for mobile device data is an emerging focus; 41% of respondents indicate they're backing up to the cloud data from smartphones, tablets and other mobile devices. This figure is likely to grow as the use of personal and company-issued mobile devices continues to surge. Companies with branches and other remote locations have also found it easier to back up satellite offices to the cloud. Thirty-two percent use this method rather than tapes or replicating remote data back to the main office.